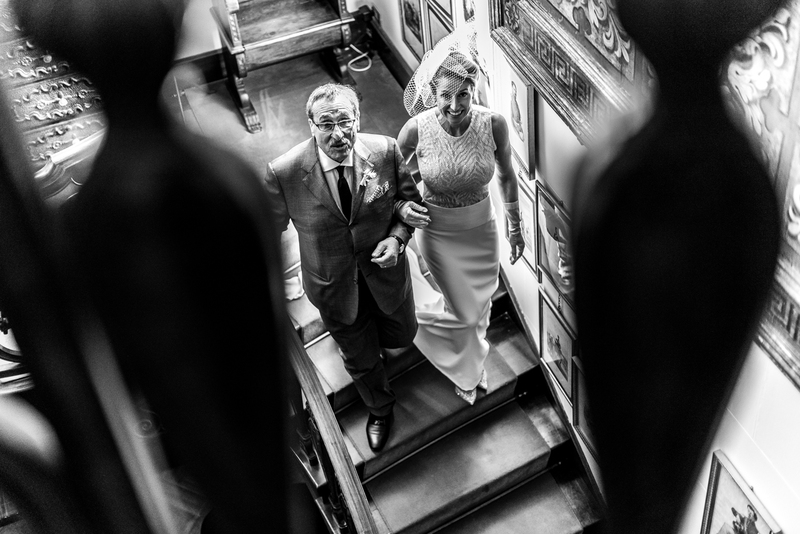 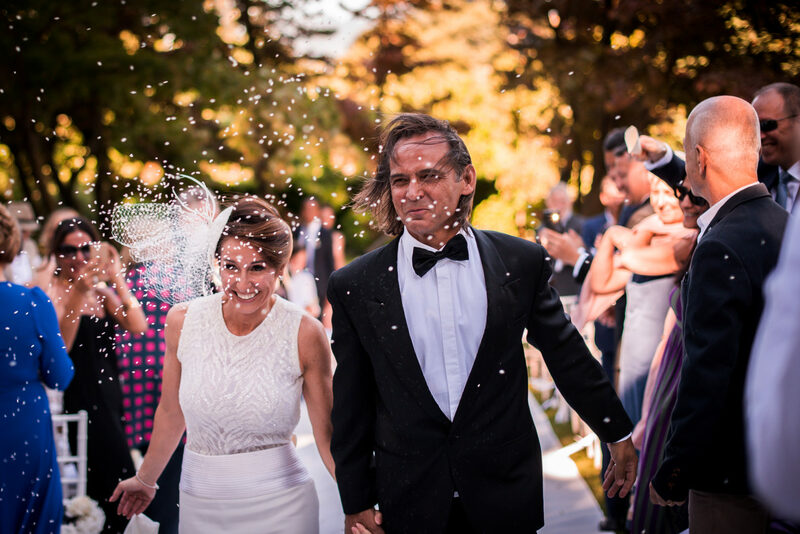 An architectural heritage of the second half of the 19th century, an ideal “stop” to escape from the city, enjoying the enchanted charm of Lake Maggiore and Stresa, which we already visit thanks to Pino and Cristina who have chosen us for their wedding day at Gran Bristol Hotel. 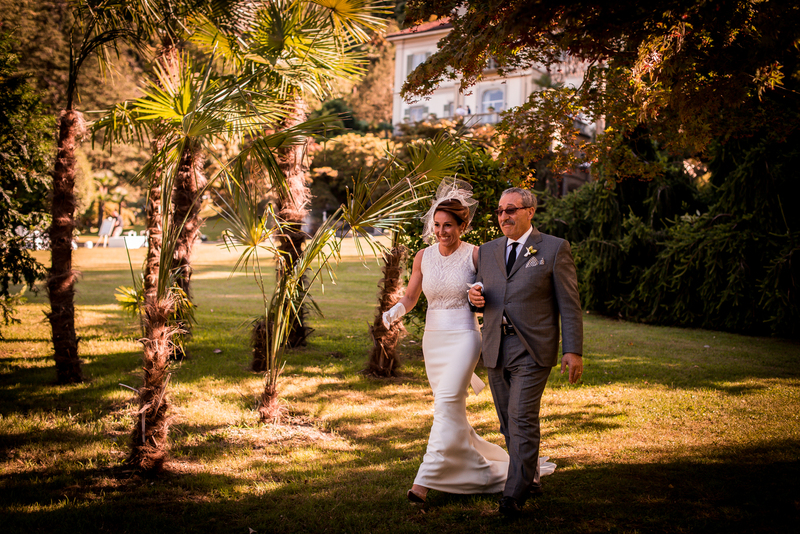 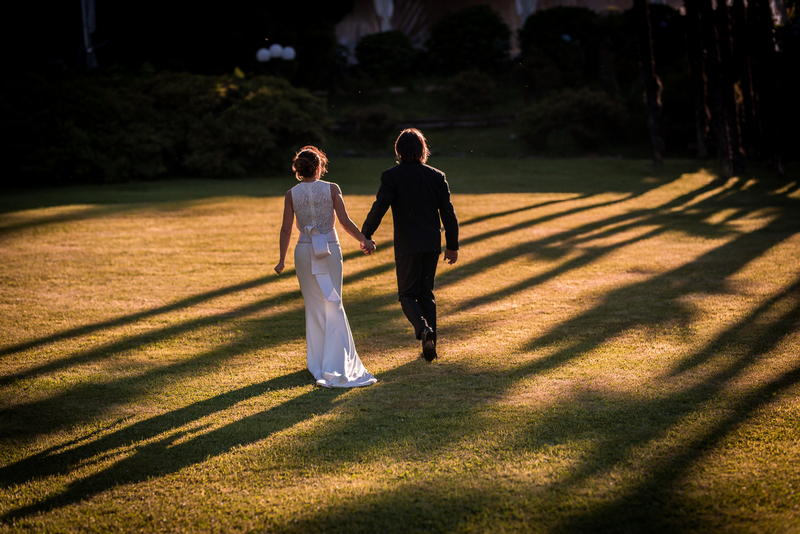 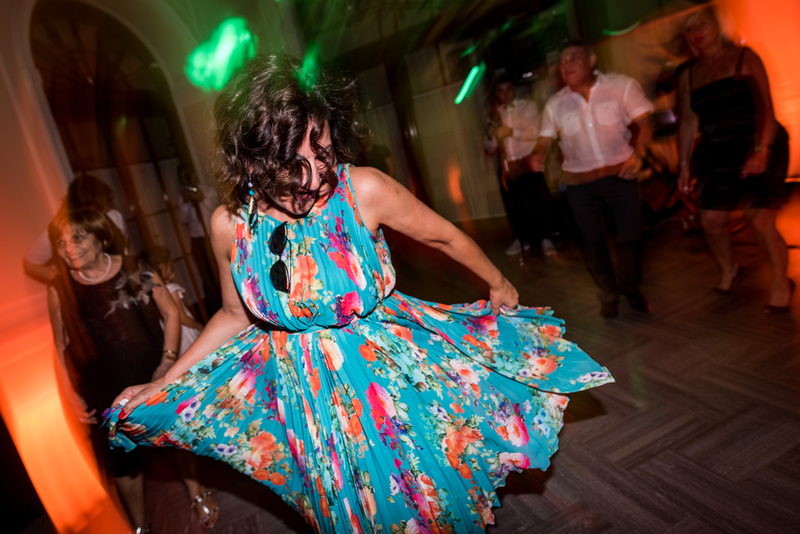 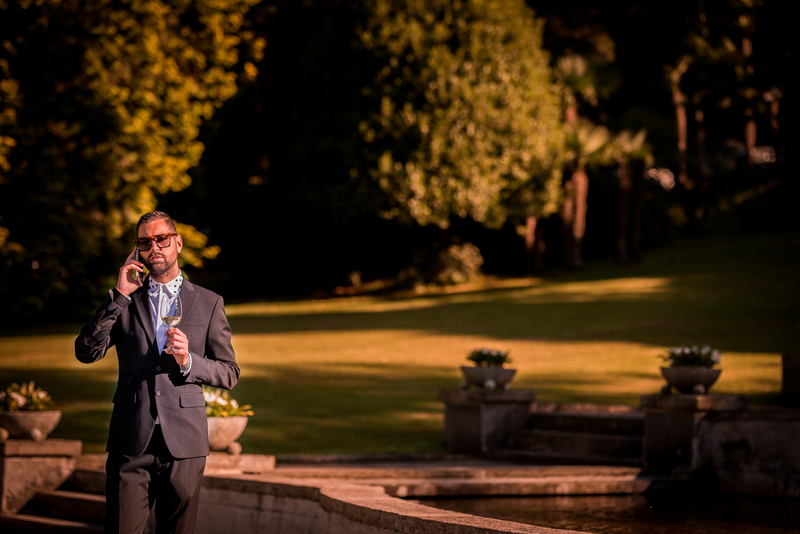 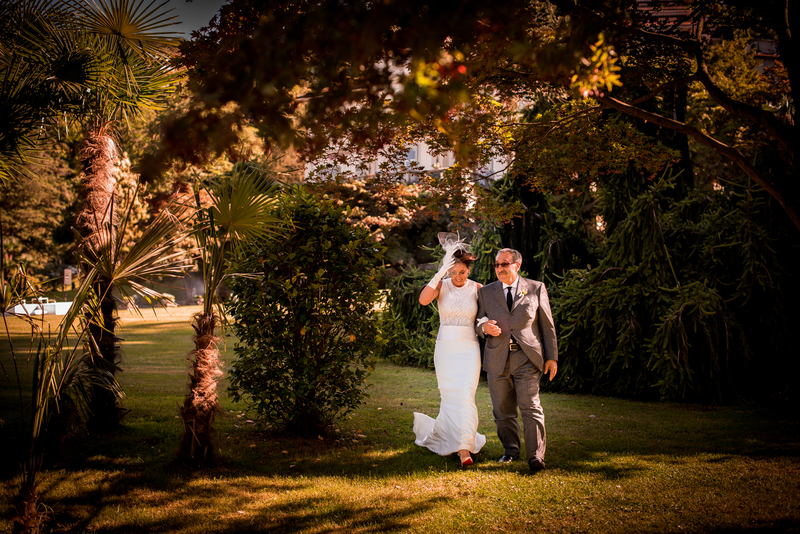 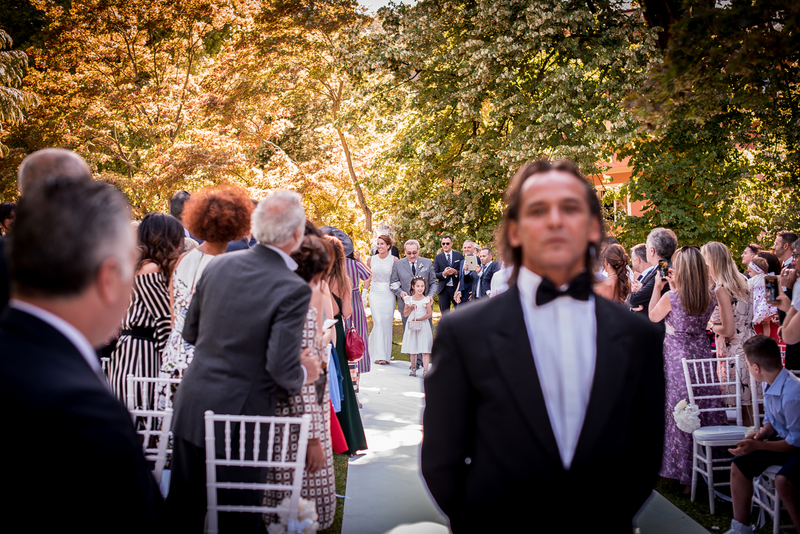 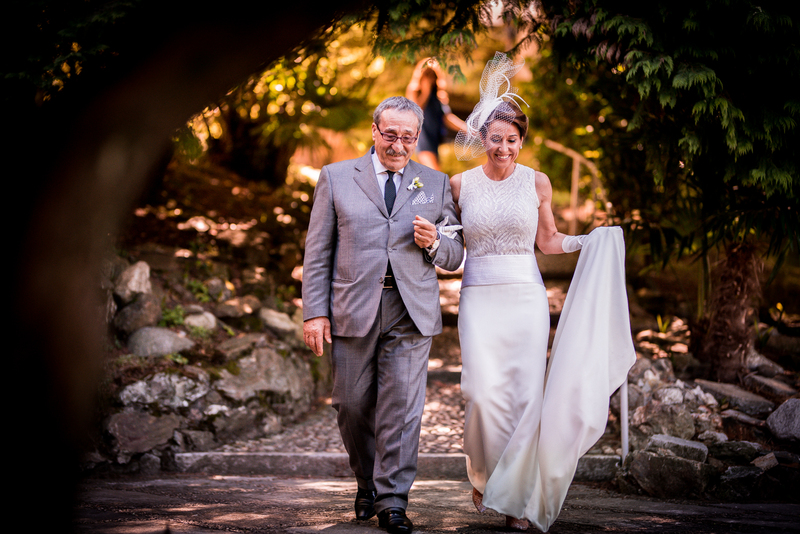 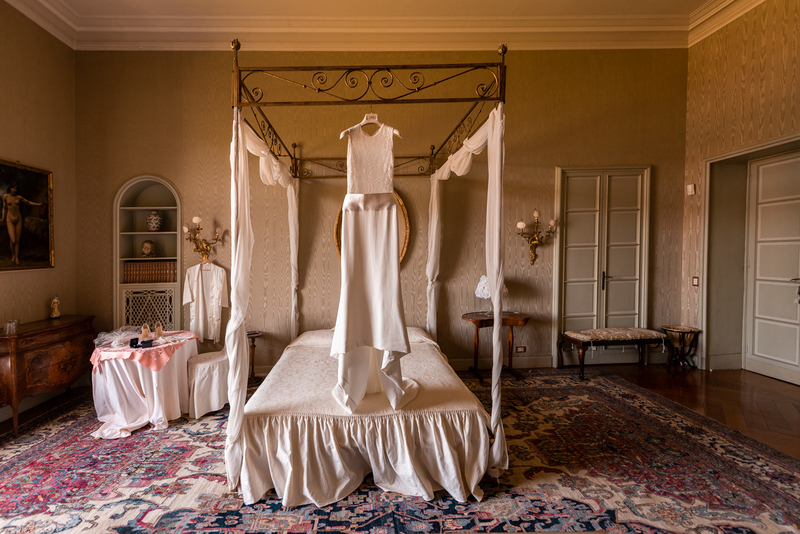 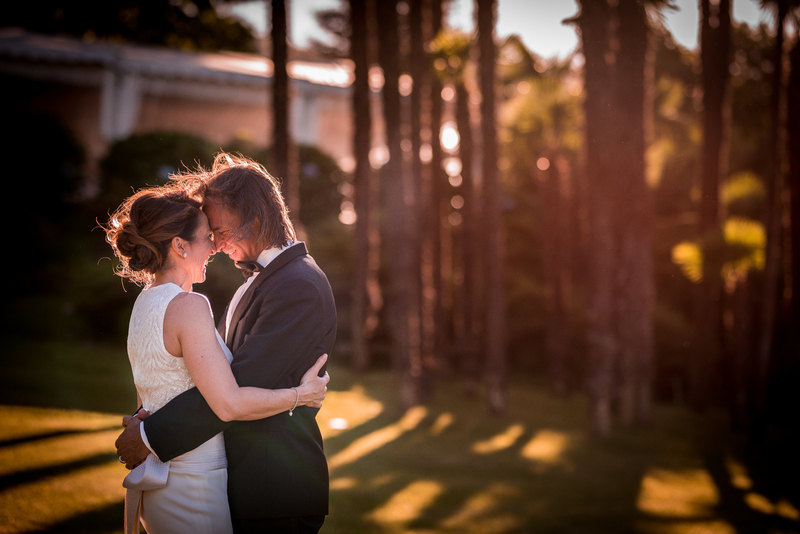 The splendor of the internal spaces of Villa Muggia and the magnificence of the park that surrounds it are of an incomparable beauty, as much as Tiziana and Patrizio on their wedding day. 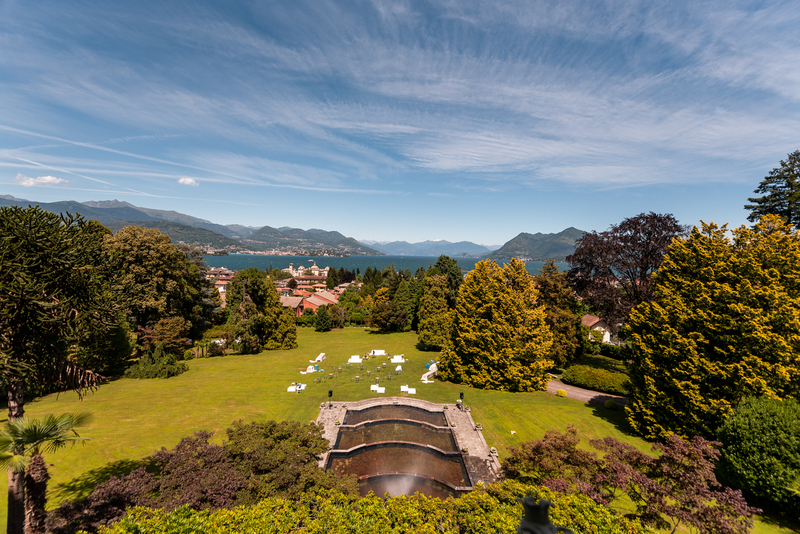 Tiziana is waiting for us in one of the imposing imperial suites of Villa Muggia: from here, the view of Stresa leaves us breathless. 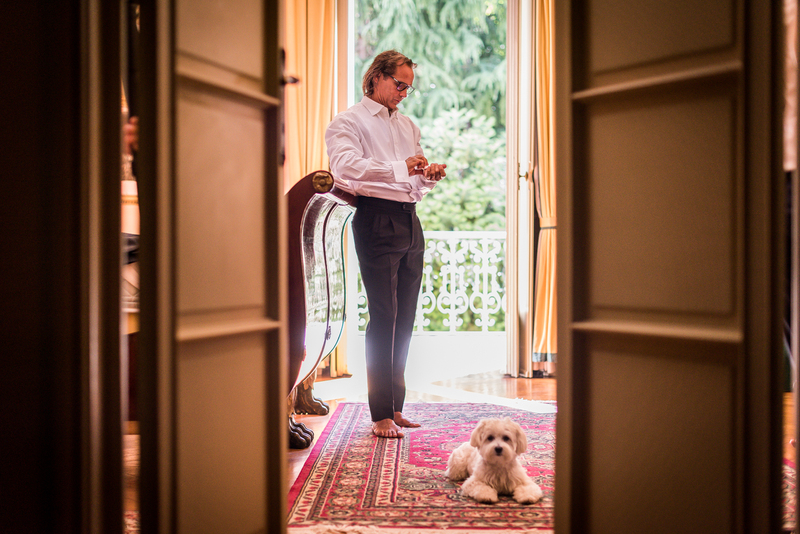 We are immediately greeted by a festive and friendly white poodle, a ‘travel companion’ of Patrizio and Tiziana: Benjamin has immediately become the mascot of the day! 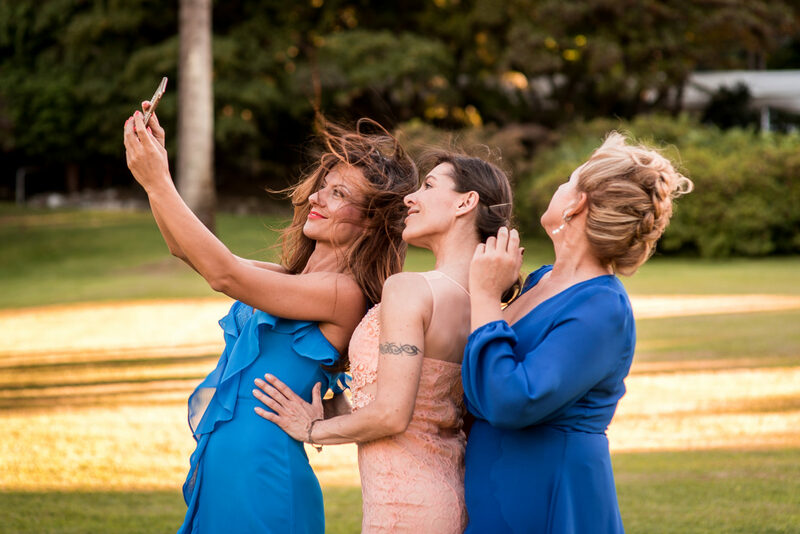 Tiziana is with her two dear friends who are taking care of the makeup, and in the next room we meet Tiziana’s mother, who runs away as soon as she sees us with the cameras. 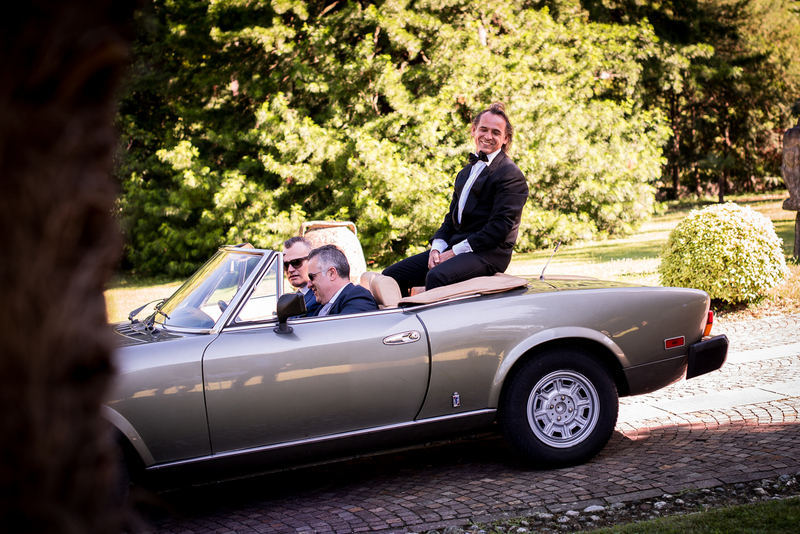 Let’s go to Patrizio, he’s very quiet: today, it’s a day of celebration, he wants to enjoy the day without getting spoiled by anxiety. 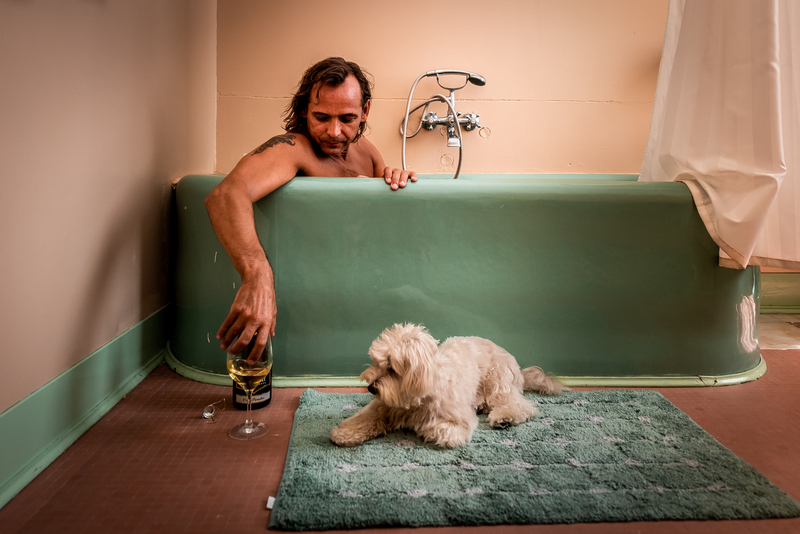 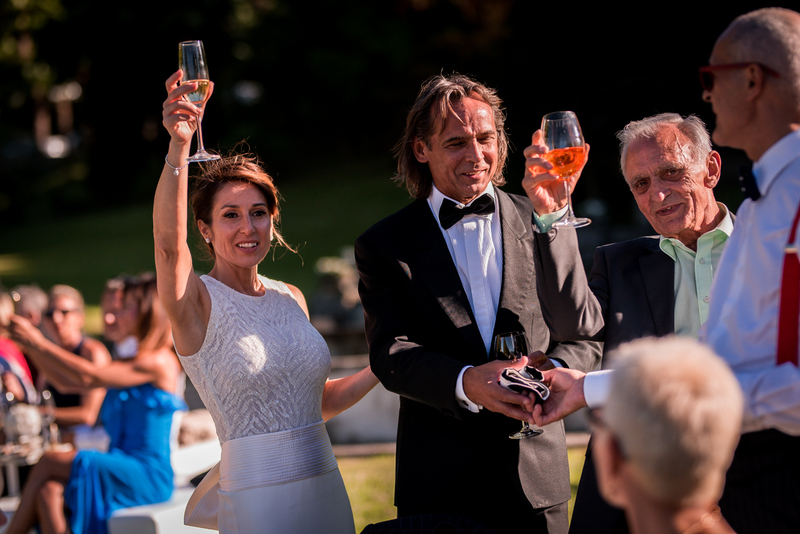 While we await his witnesses, Patrizio opens a bottle of champagne: he says today will be a party for everyone! 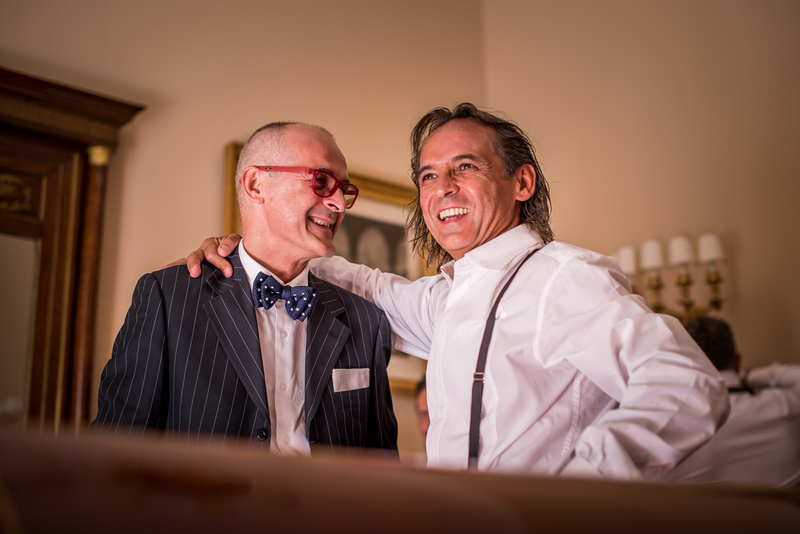 Cheers Patrizio, and thank you! 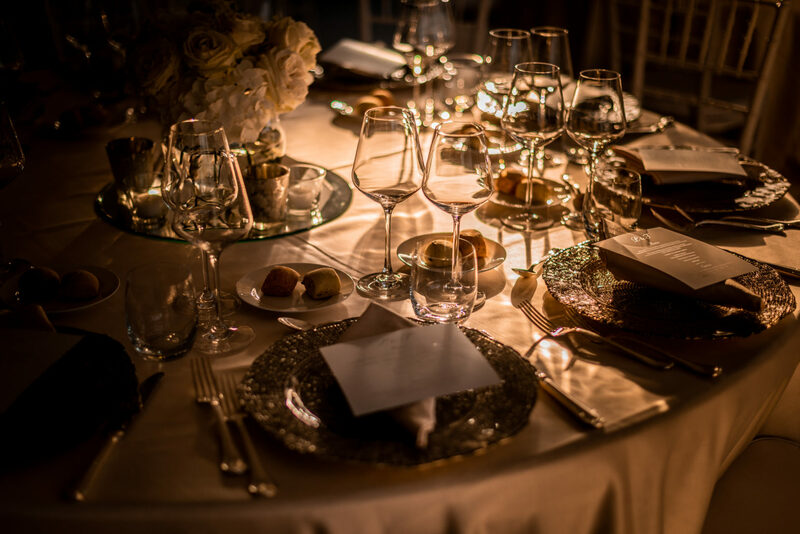 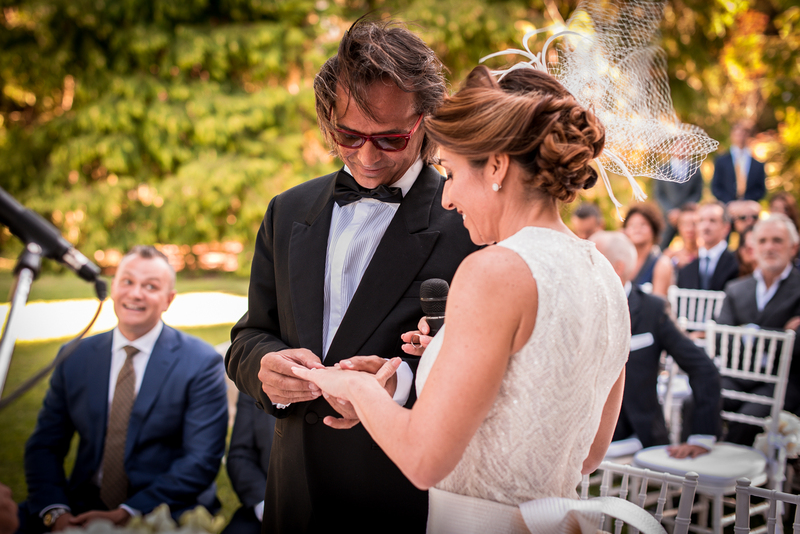 It’s time to prepare, Patrizio wears an elegant black smoking with the help of his brother and his witnesses, Tiziana wears a romantic white dress embellished with some details, a pair of very special shoes and a few drops of perfume. 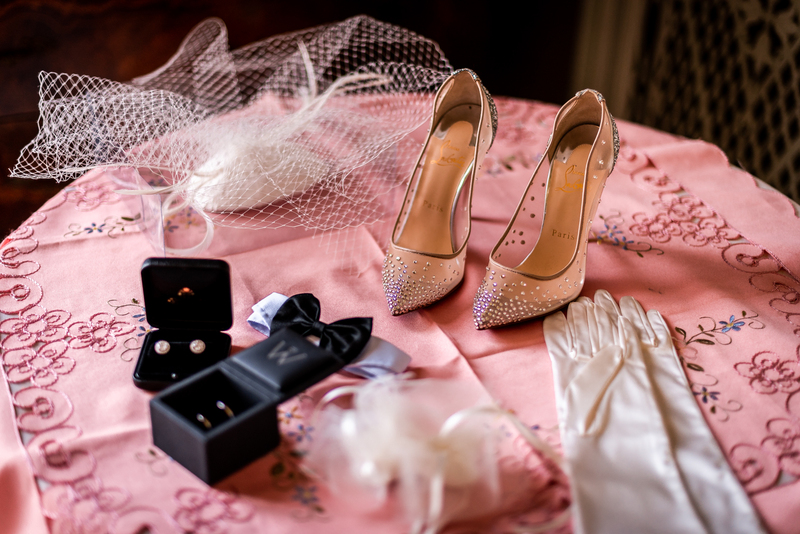 They are ready. 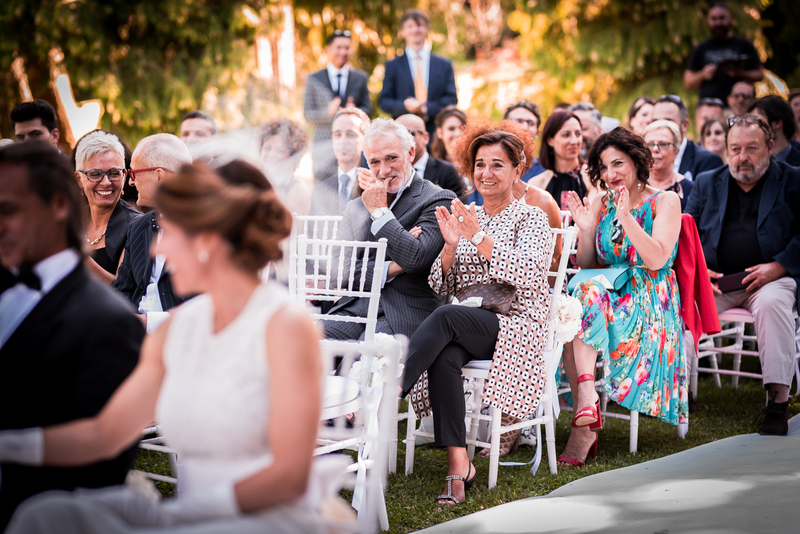 Patrizio’s aunt waits for him before the area set up for the civil ceremony and immediately gets excited when she sees her nephew; Tiziana’s father, a man with typical exuberance of the south Italy, softens the emotion with a few lines (and a touch of emotion for his “little girl”) and so Tiziana is ready to join Patrizio. 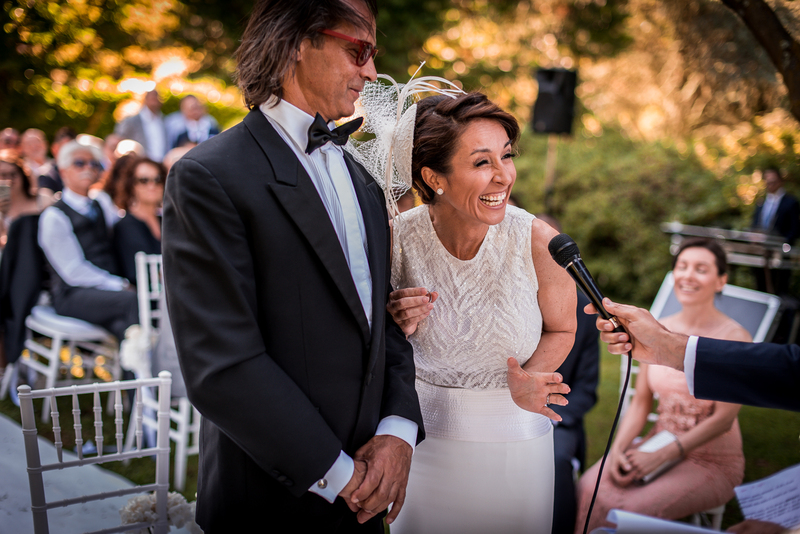 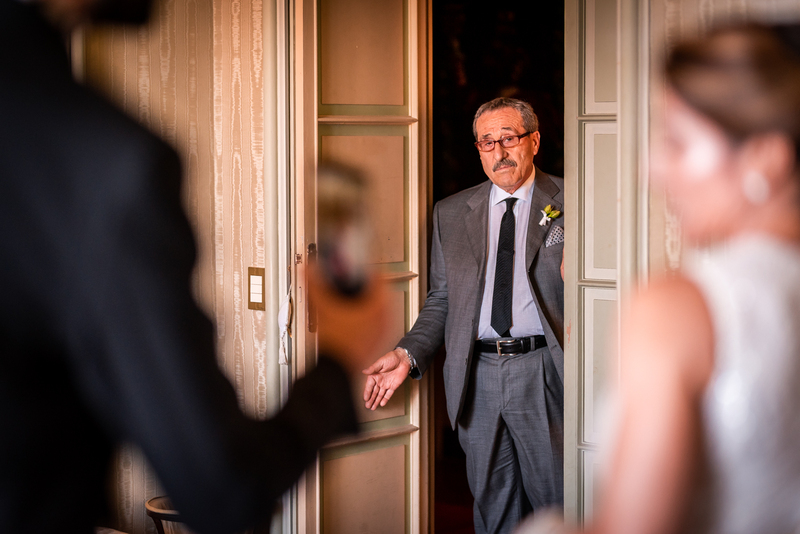 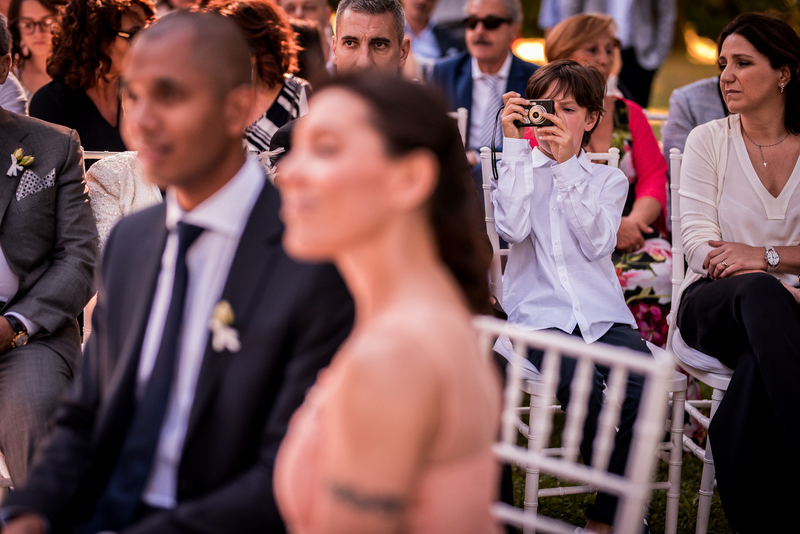 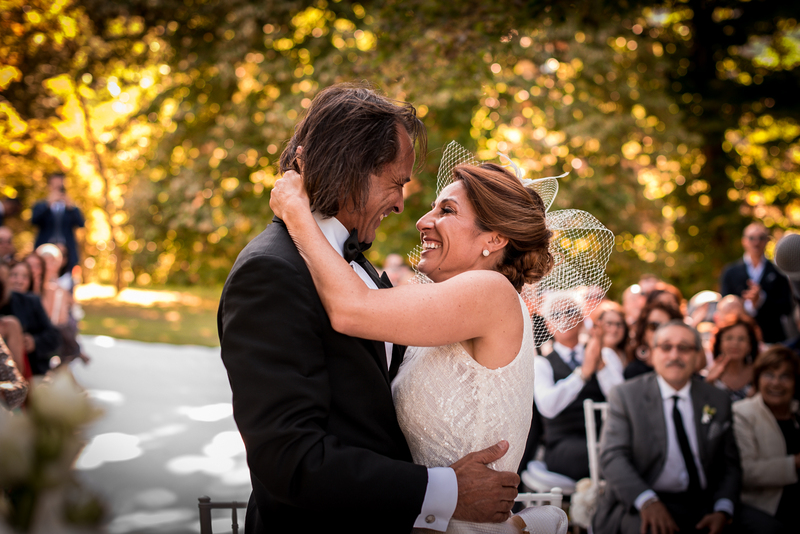 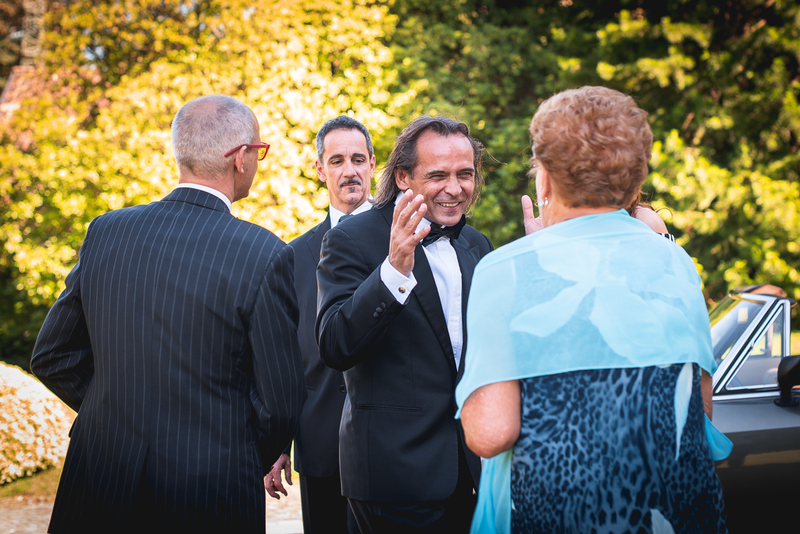 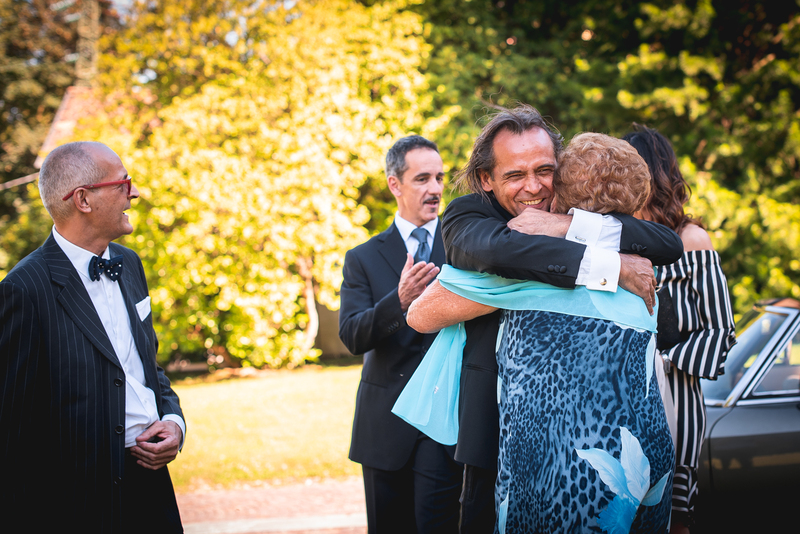 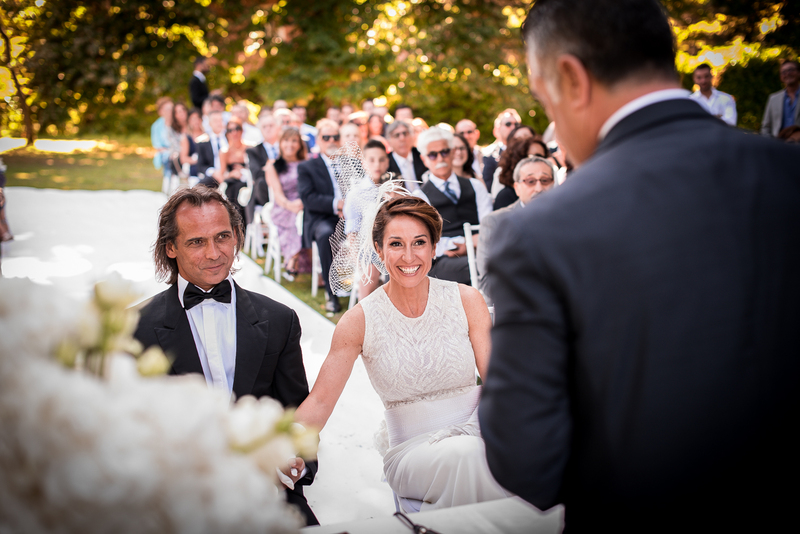 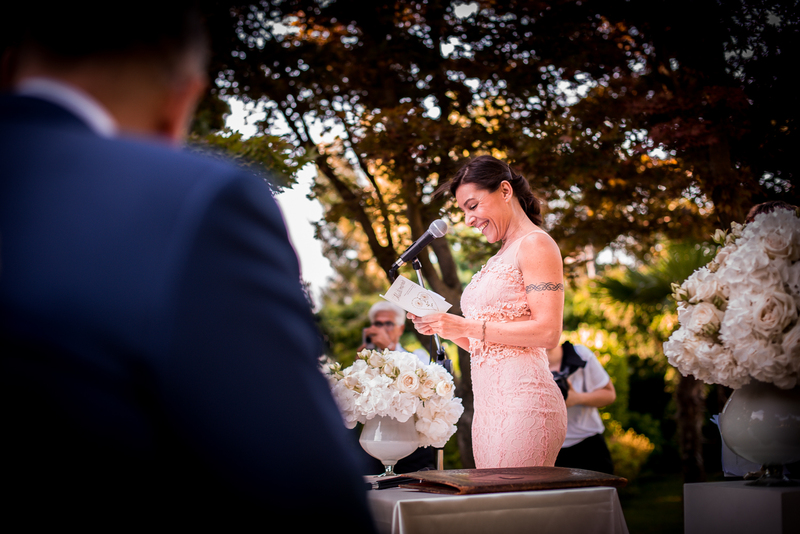 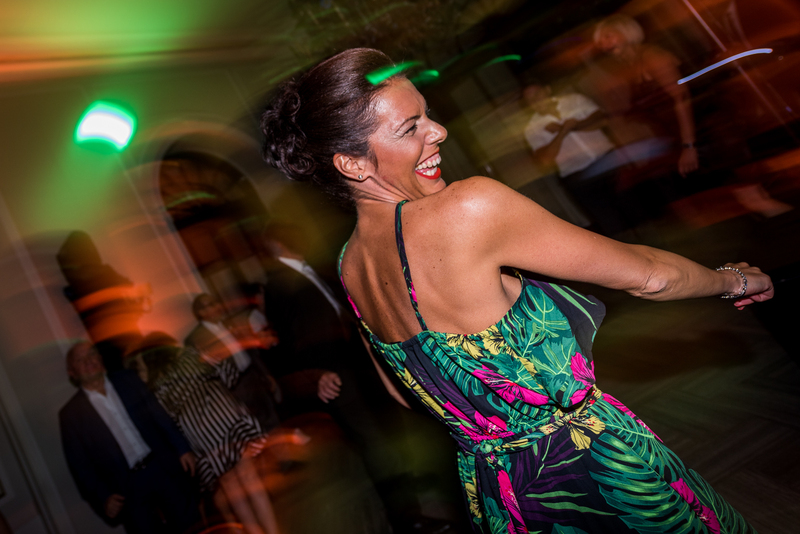 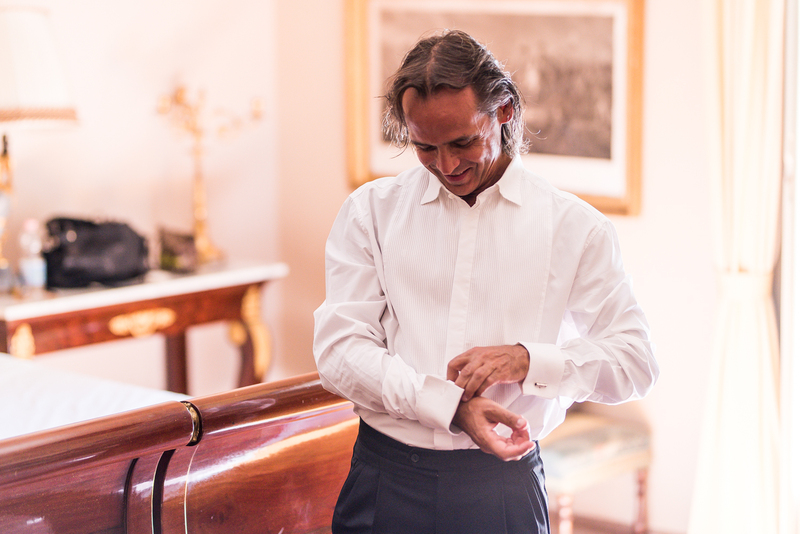 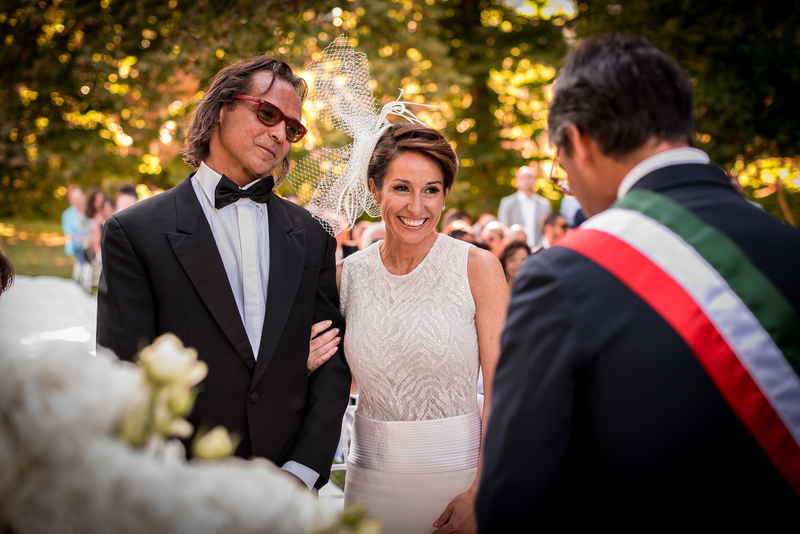 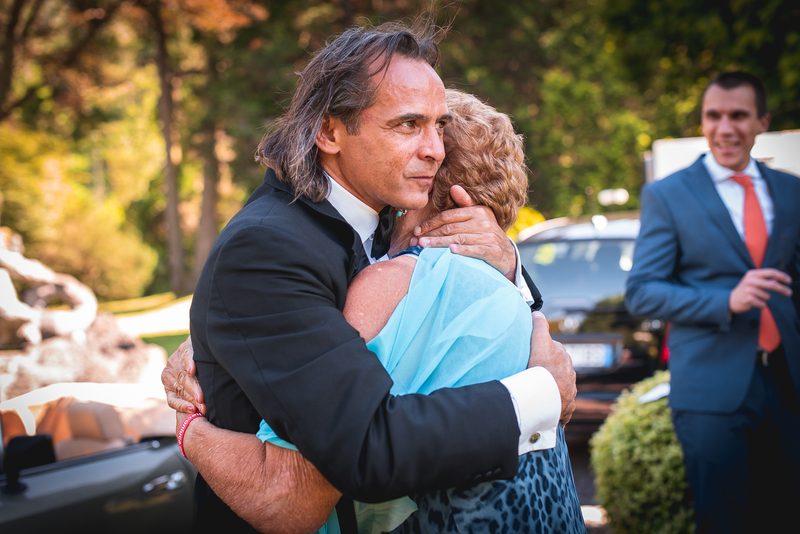 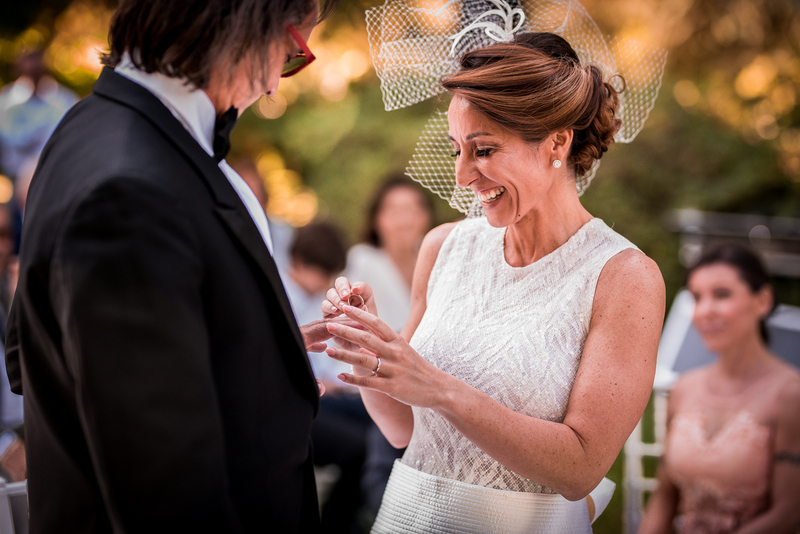 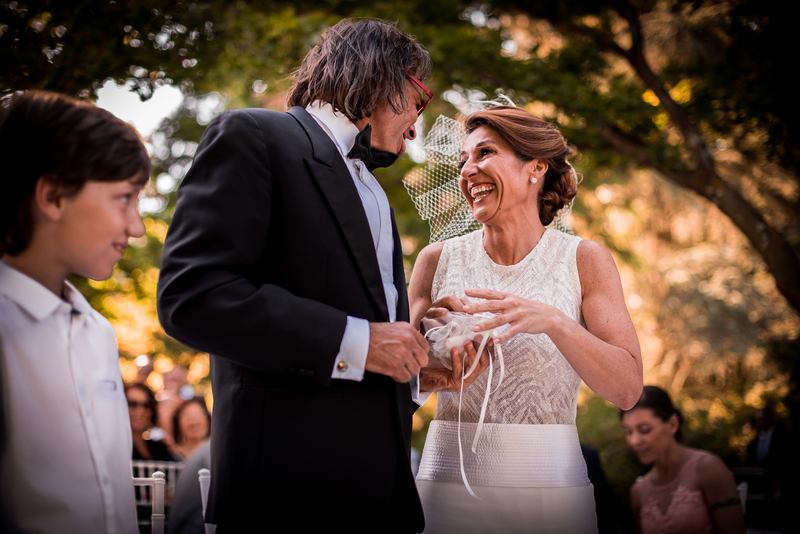 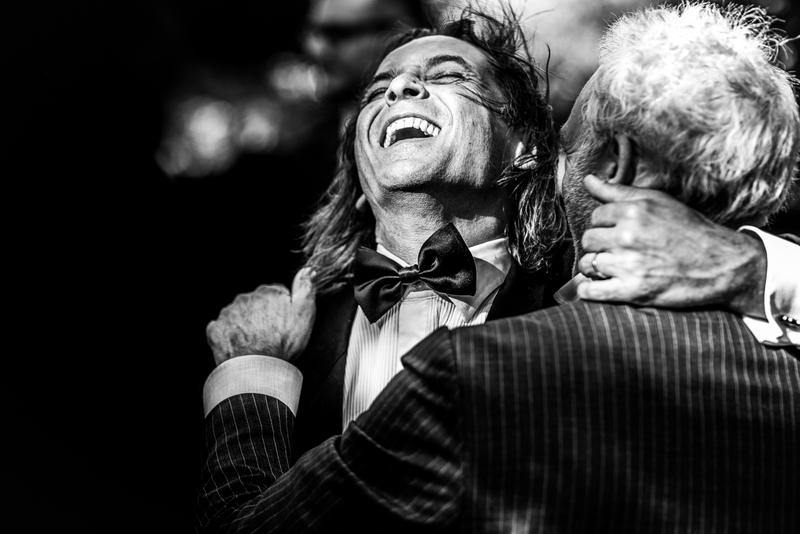 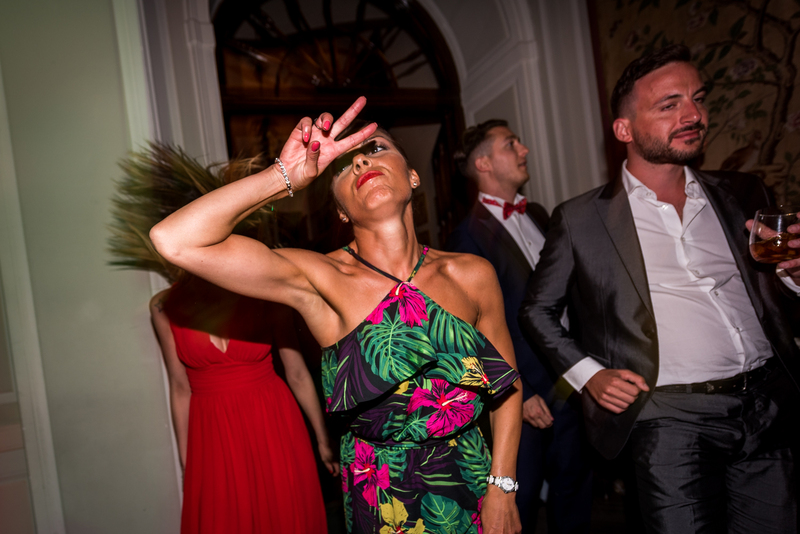 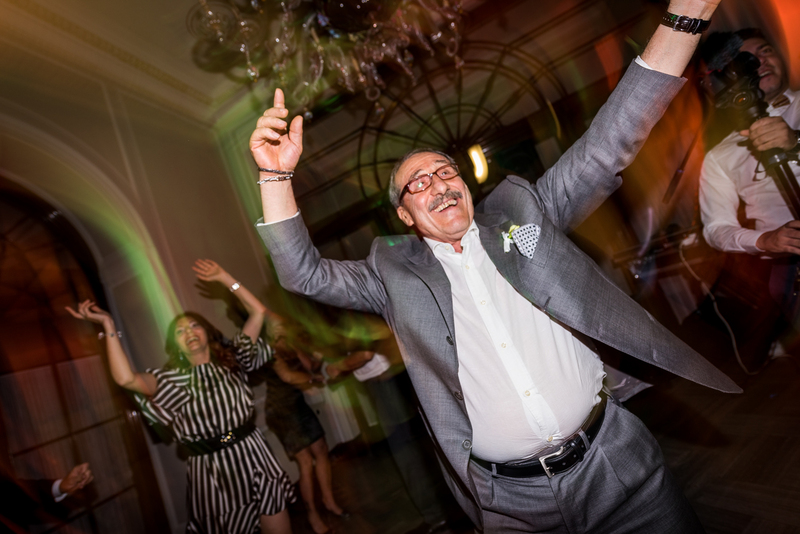 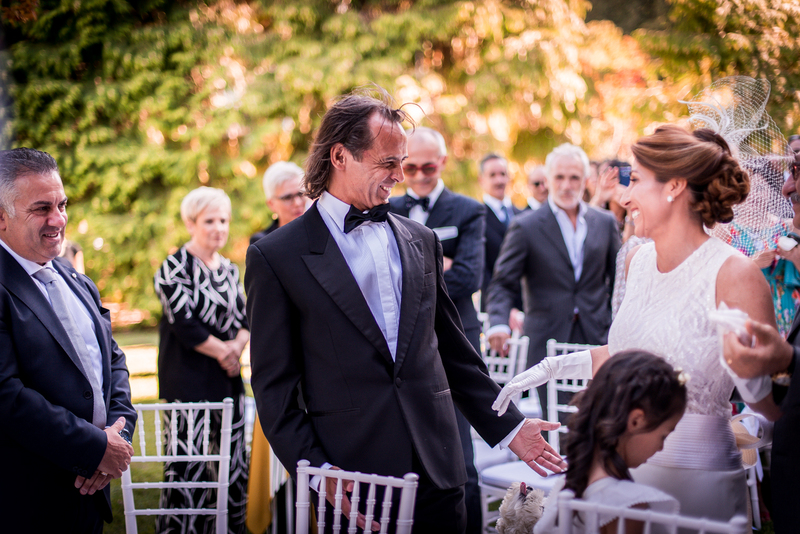 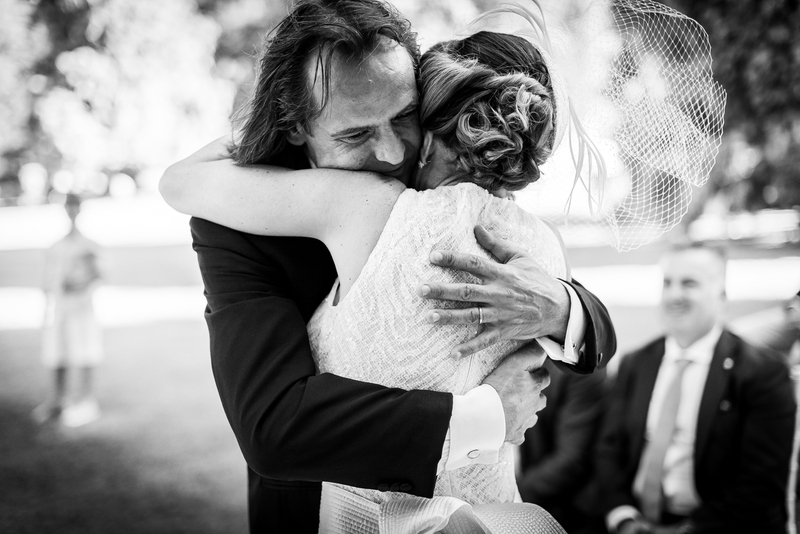 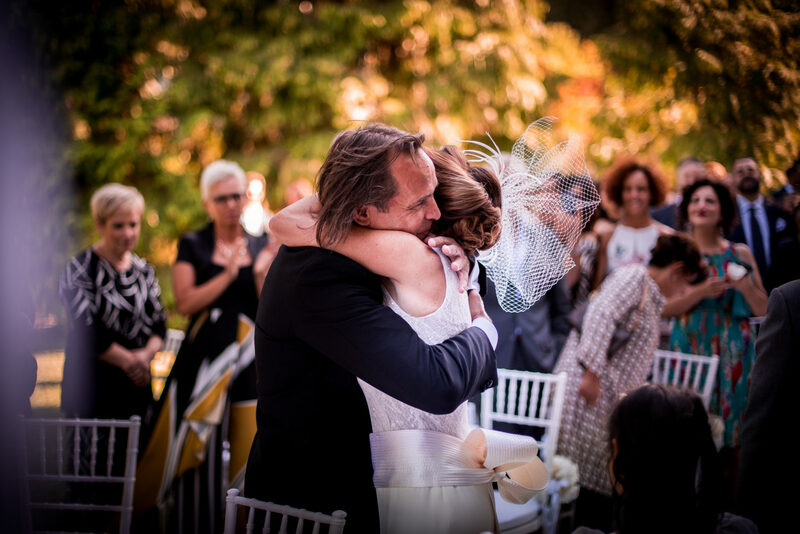 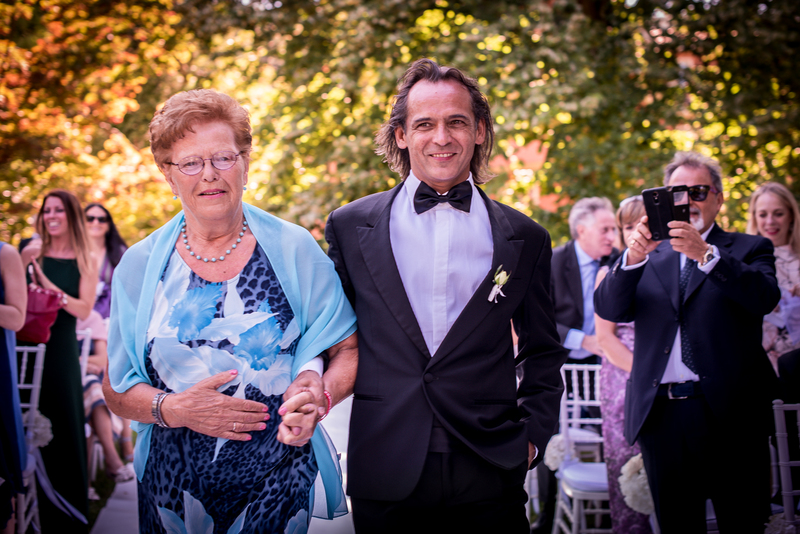 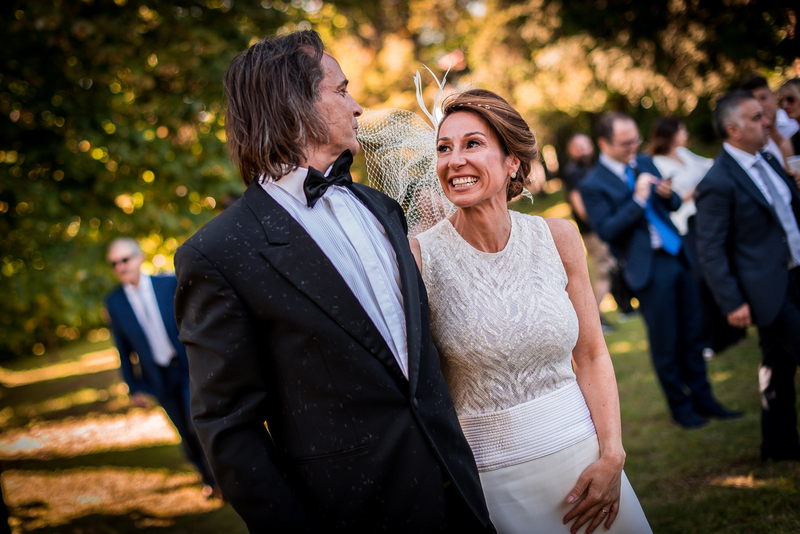 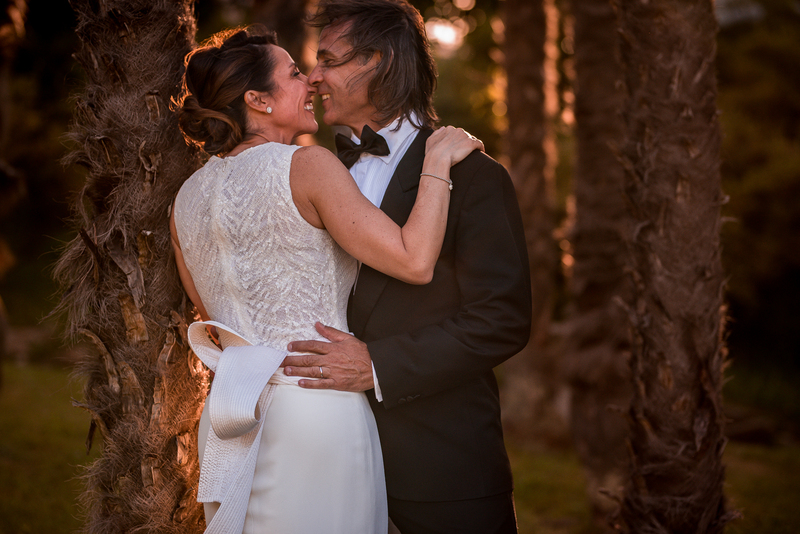 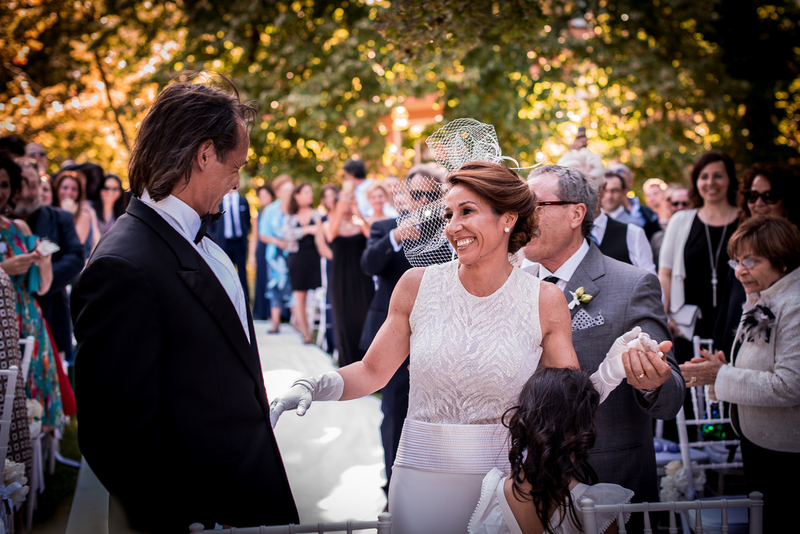 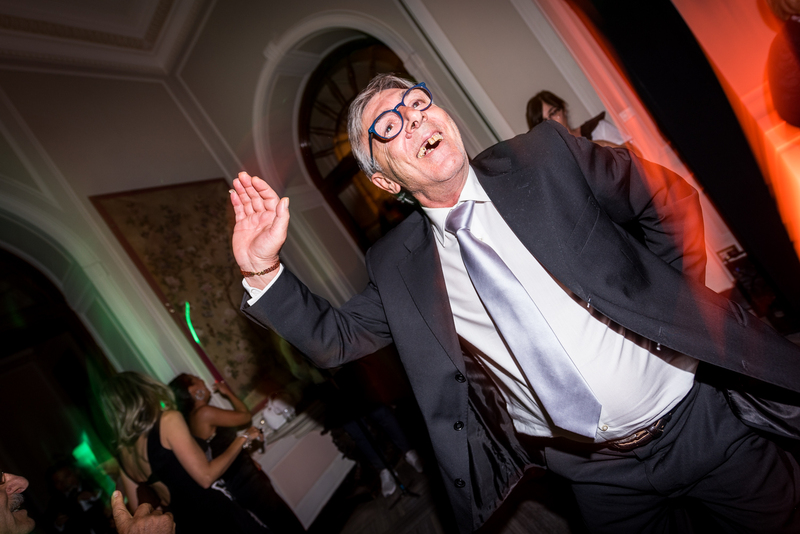 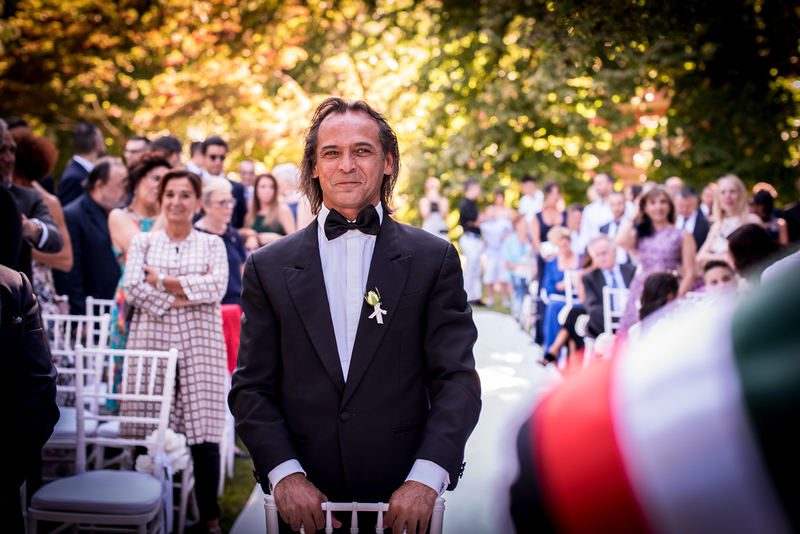 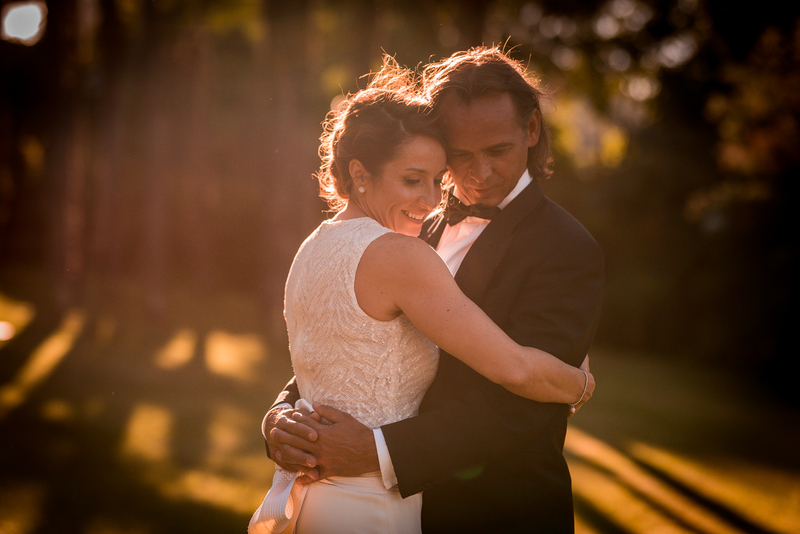 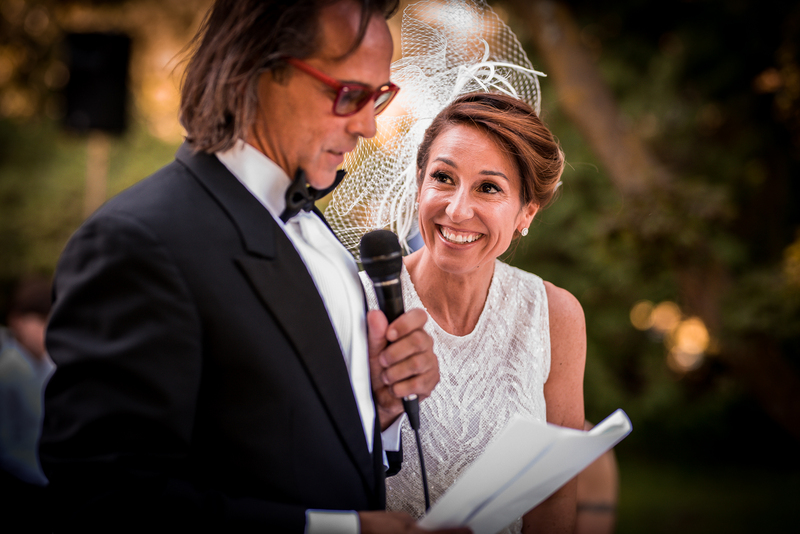 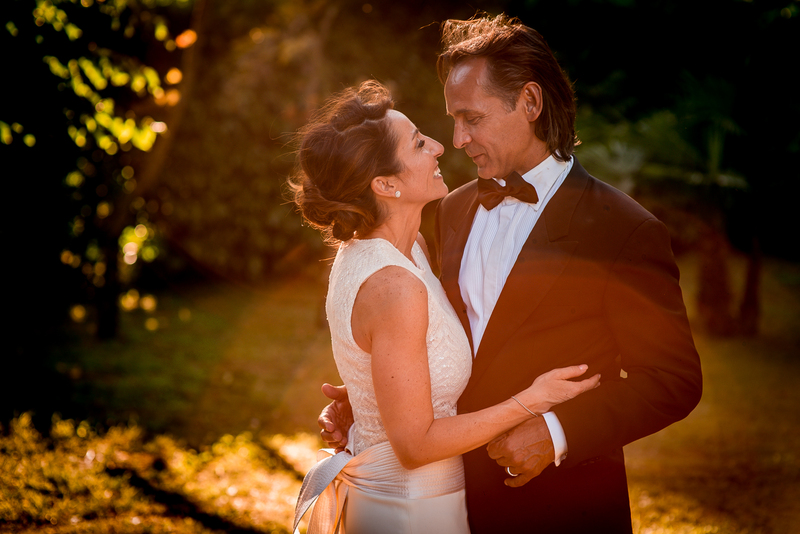 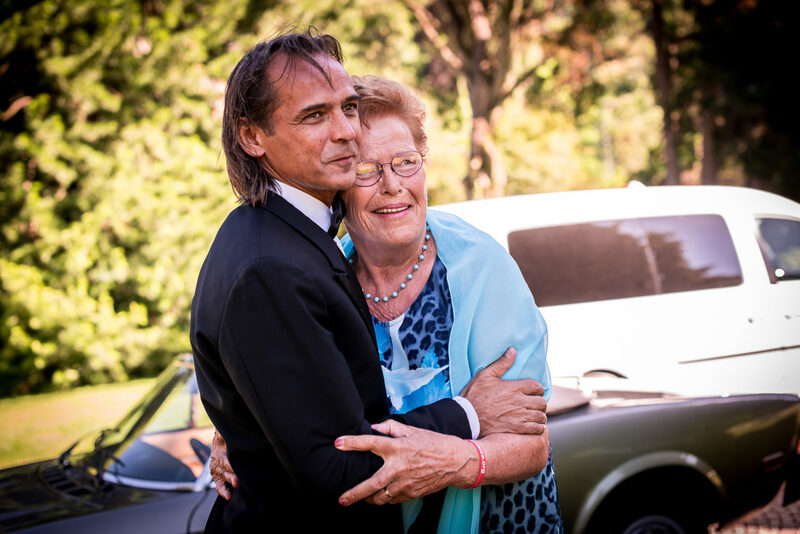 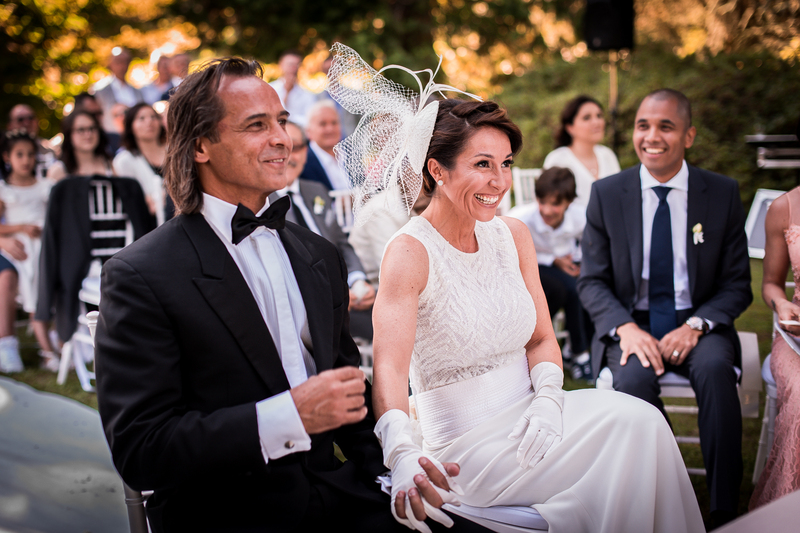 Patrizio, who until then was quiet, as soon as he sees Tiziana gets excited, can not hold back the tears as well as all the guests in seeing this special moment. 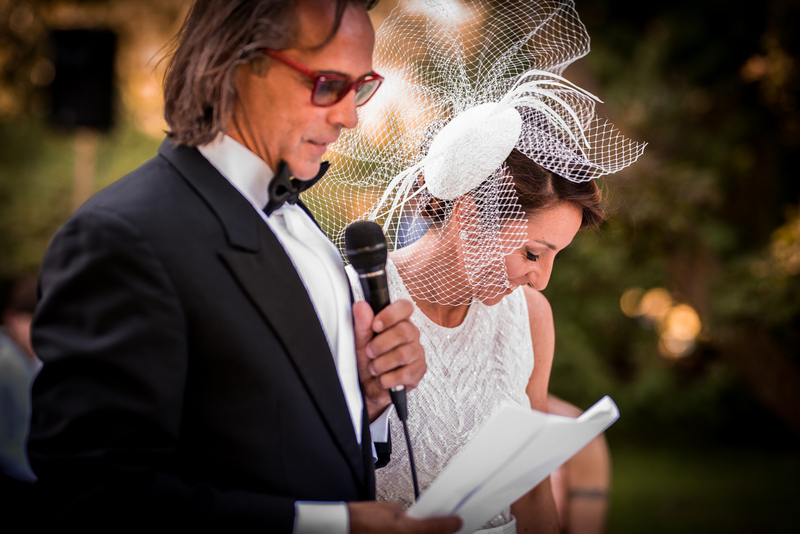 Some speeches that involve all those present, who can not wait to hug and celebrate Patrizio and Tiziana with a super rice-launch. 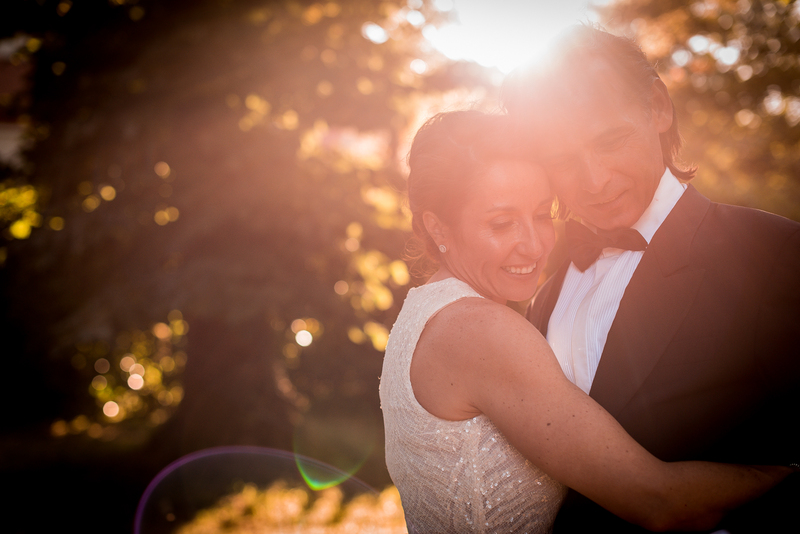 The light of the sunset allows us to take some photos of the couple while the guests are enjoying the aperitif set up in the park of Villa Muggia before moving to the area set up for dinner: a sky of stars makes us thrill again. 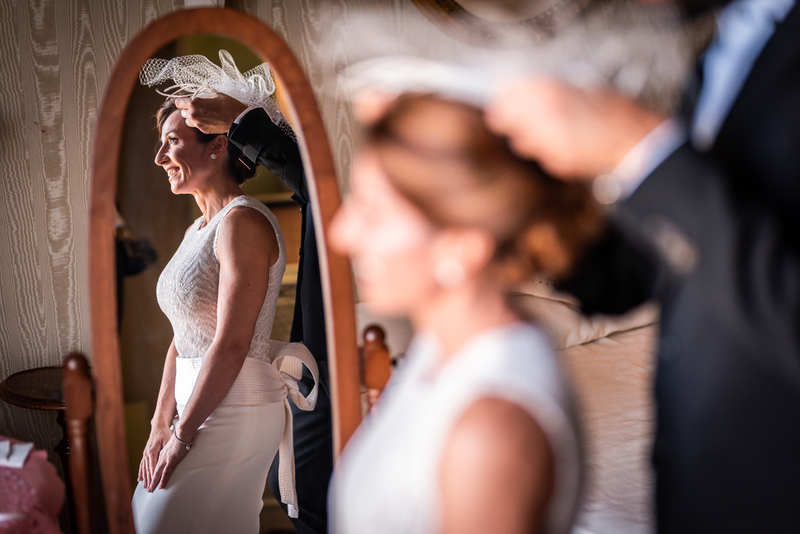 Tiziana make their guests wait, but as they say, the wait increases expectations and Tiziana has overcome them. 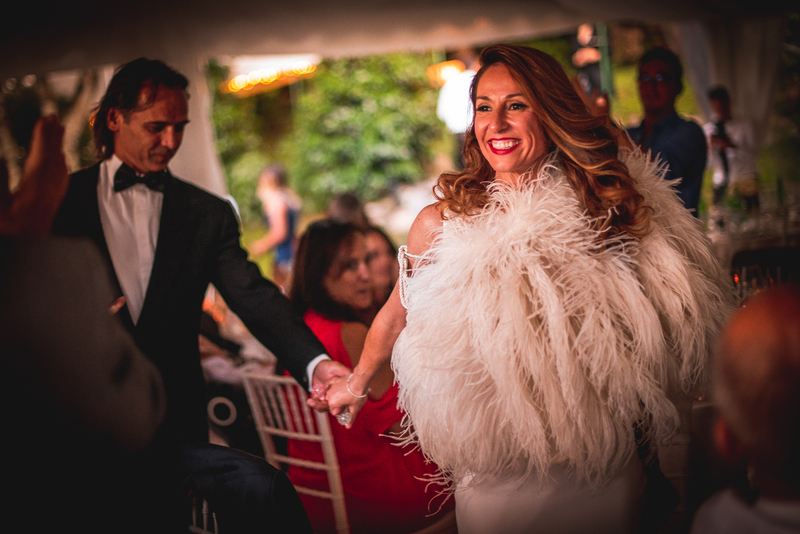 A little ‘make-up on the make-up’, hair with soft waves and a shawl of feathers (synthetic) makes everyone stay, and especially Patrizio, open-mouthed. 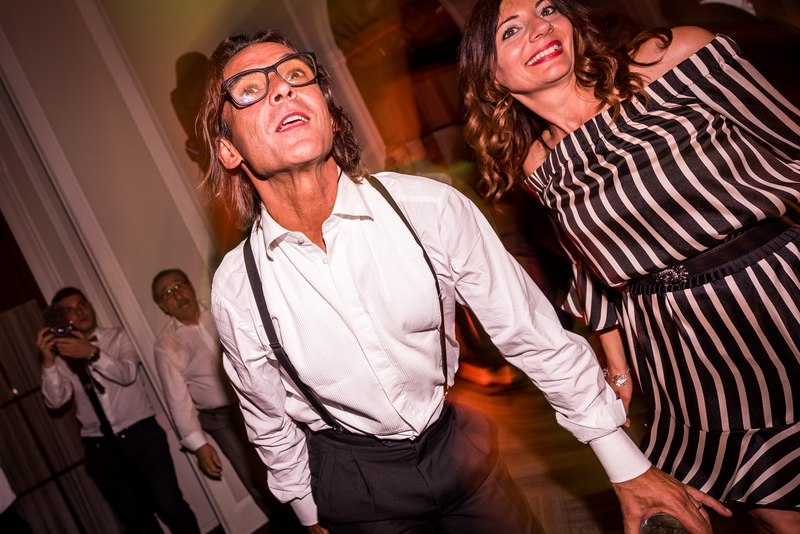 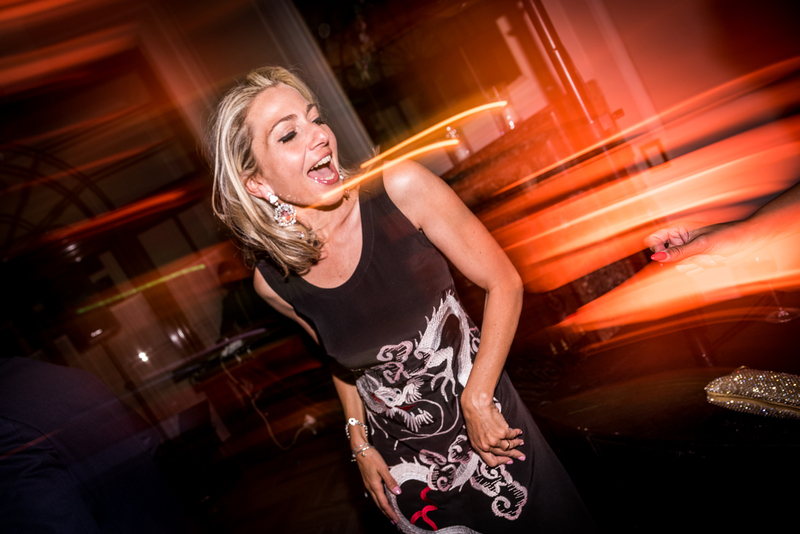 The party can start but the surprises are not over! 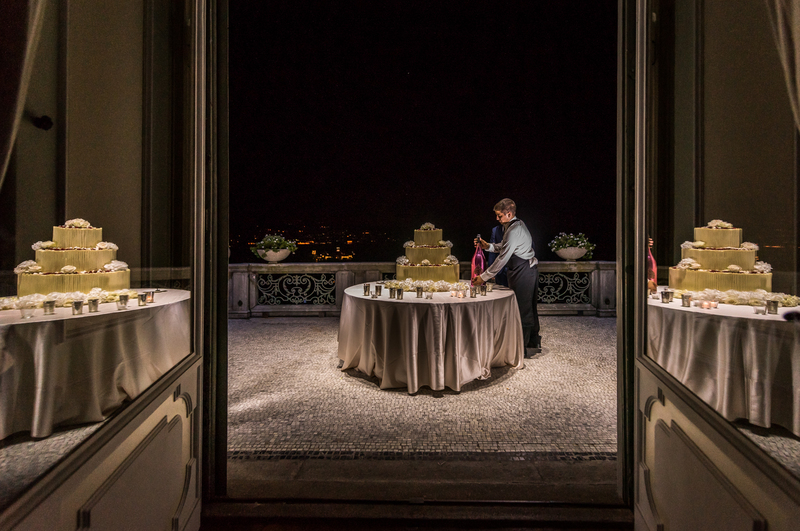 The cut of the cake on the terrace with a view of all Stresa and the fireworks (as they were for the wedding of Katherina and Alberto) are the perfect closure for a day that could not have gone better than that! 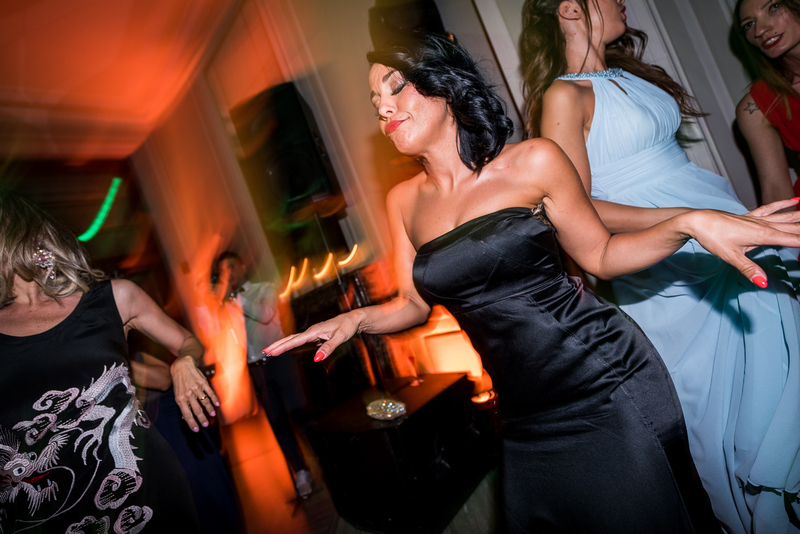 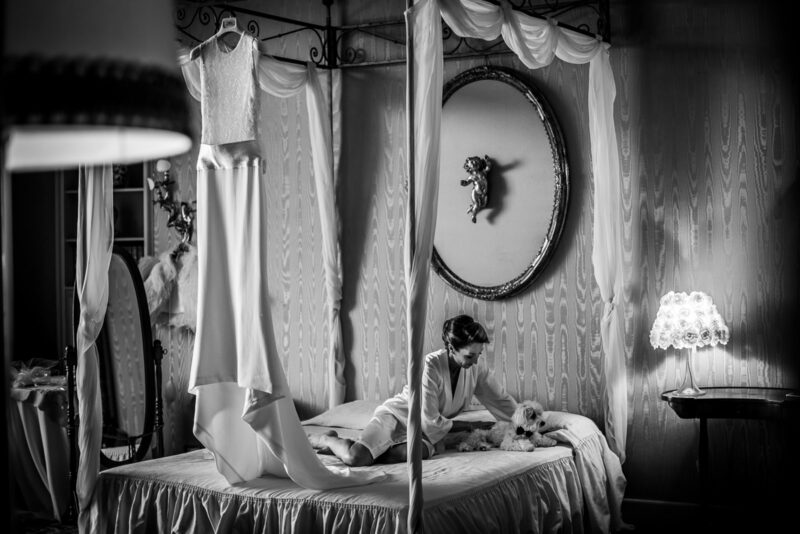 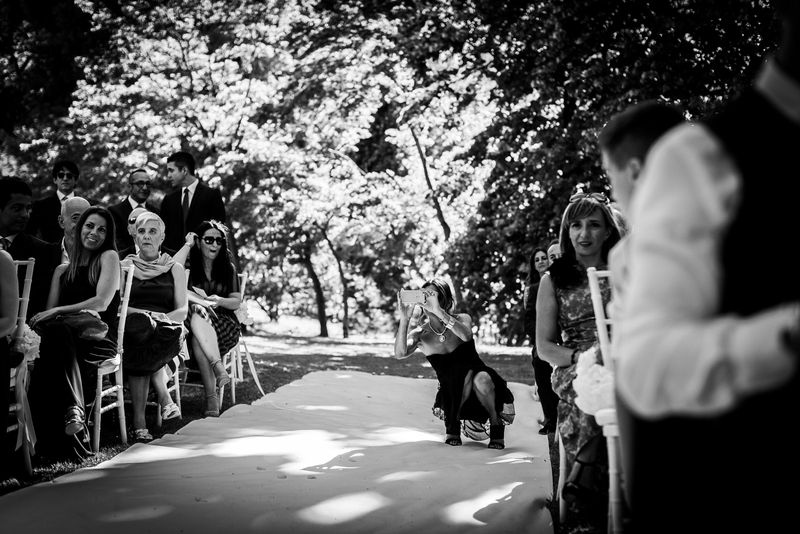 For more info about your wedding reportage, write me!